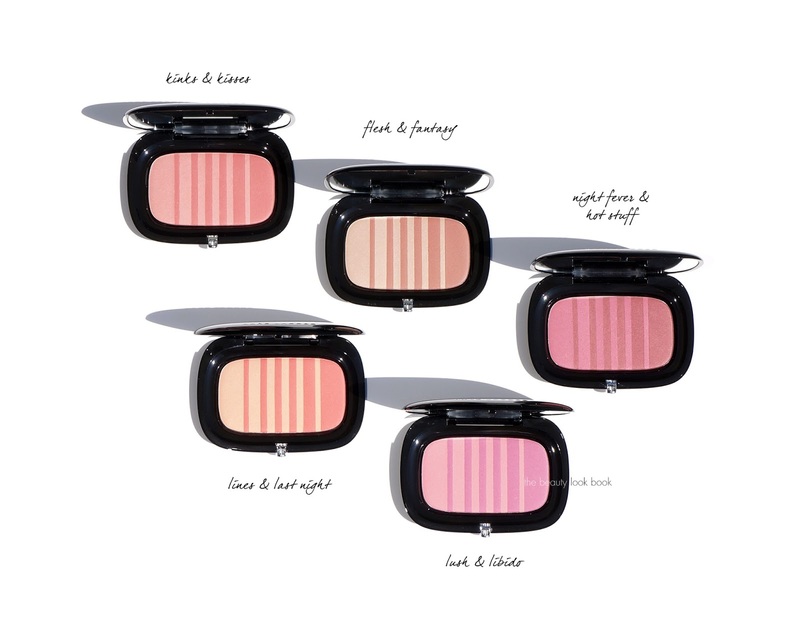 Marc Jacobs Beauty launched five shades of blush called the Air Blush Soft Glow Duo ($42 each for 8 g / 0.282 oz, made in Italy). I bought three of the shades back at the end of July and have been obsessed ever since. It was literally love at first swipe. I was just about to post my review when a surprise press box of all the colors arrived so I re-photographed and re-swatched everything all together for a comprehensive post. There are five colors total and although not new, they recommend the Angled Blush Brush ($38, reviewed here) for application. 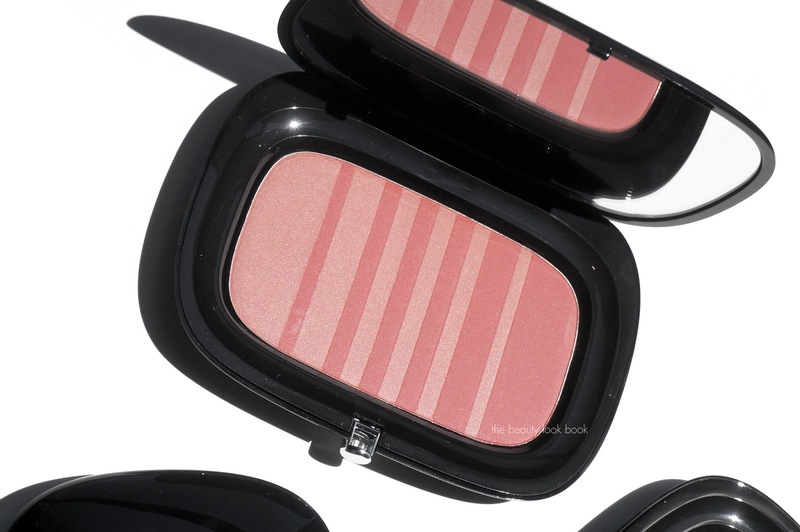 The Marc Jacobs Beauty Air Blush has a similar concept to that of the Hourglass Ambient Lighting Blushes (reviewed here) in the sense that both contain two colors in each compact, one being a lighter softer shade and the other being a deeper or brighter blush color. The Hourglass blushes all have a highlighter color swirled in so they have a more luminous shimmer on the skin while the Marc Jacobs Beauty ones have a more satiny finish with less shimmer. At $42 each I was expecting to be slightly disappointed because they are very expensive and I thought there might be a chance that they would not live up to my expectations because of the price. After testing these though I am pleased to report a thumbs up. They are indeed everything others have been raving about. The texture is indeed silky soft like they claim with a finish that looks like skin (not powdery) and they add a nice radiant natural glow to the cheeks. If you’re one who avoids shimmer blush at all costs but have been wanting something that glows this is it. 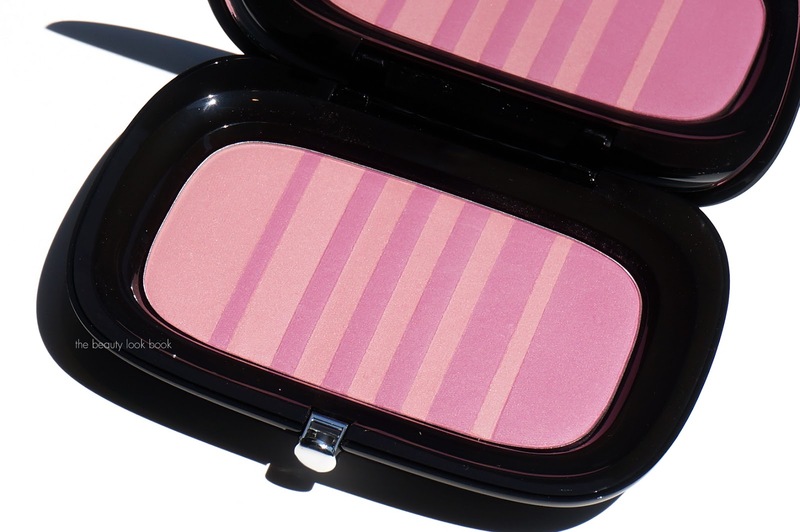 It has a similar finish on the skin to that of Chanel blushes (US versions) that have a soft shimmer. I’m still not really thrilled about the price but I have no complaints as the quality, finish, packaging and colors are really superb. The three shades I picked out were Kinks and Kisses, Lush and Libido and Flesh and Fantasy. After testing out the other two shades, I still think my first picks were the best ones for my skintone. These are striped with alternating colors which makes blending the two shades perfect. I really love the fact that each end has a slightly larger area of color so you can actually customize the intensity or color. Swirl the brush more on the left side for a lighter finish or dip it into the right side for more pigment and deeper color. A few comparison swatches to show the difference in pigment, undertone and shimmer. What I like about the Marc Jacobs Beauty Air Blush is that they look soft and luminous on the skin, but the luminosity is diffused unlike other glowy products so if you photograph with a flash there’s no glare like with other strong shimmers. Bottom line thumbs up. These have the perfect in between mix of satin and shimmer. They are luminous in a very natural sense so there’s no glare from shimmer or frost, yet there’s enough glow to give the skin that soft sheen. They are powdery so there is kick up like with most powder blushes. There’s no detectable scent in these which is a huge plus for someone like myself who has a sensitive nose. Even better – these don’t emphasize pores or imperfections on the cheeks. No irritation either. They do warm up on the skin very slightly but don’t darken a lot. In terms of lasting power I found these did stay put from morning to late afternoon without fading or sliding. I still am unsure how I feel about the $42 price tag but then I have paid more for Chanel, Tom Ford, NARS Dual Intensity Blushes to name a few. In my mind I still think of blush as something that should be in the $18 to $35 range at most but I like the decent sized compact and the fact that they don’t waste compact space on a mini brush which I usually find useless in most powder or blush compacts. In terms of the brushes to use, any blush brush will do. I tried this with the recommended Marc Jacobs Beauty Angled Brush (which I had from holiday) and this gives the most sheer and natural finish on the cheeks. The bristles are soft and while they do pick up color, they dispense a sheer wash of color. I also tried this with the Chanel Blush Brush and MAC Angled Contour Brush #168 (both my most reached for blush brushes) and both worked equally well. They did pick up more color than the one from Marc Jacobs. I like those two because the size is perfect for my cheek shape and face size. Although these are spendy I don’t think you’ll be disappointed if you splurge on one. There’s nothing bad I can say about these. Formula and packaging are both on point. 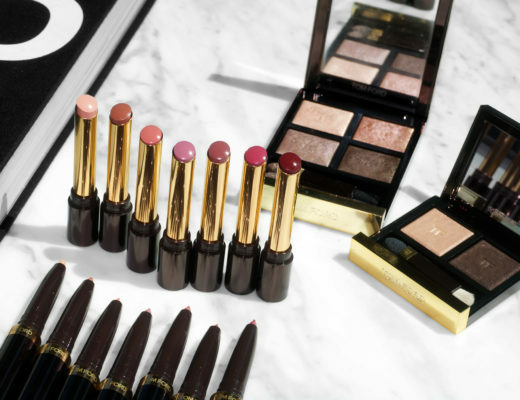 There seems to be a wide range of colors to suit anyone’s taste and I do think they are shades that are versatile no matter what skin tone or undertone you have. You can find the Marc Jacobs Beauty Air Blush Soft Glow Duos at Marc Jacobs Beauty, Sephora, Neiman Marcus and Bergdorf Goodman. Have you tried these yet? What did you think? Blushes and brush gifted by the Marc Jacobs Beauty team for review, although I did also purchase three of the shades to test out long before I discovered a press box was on it’s way.